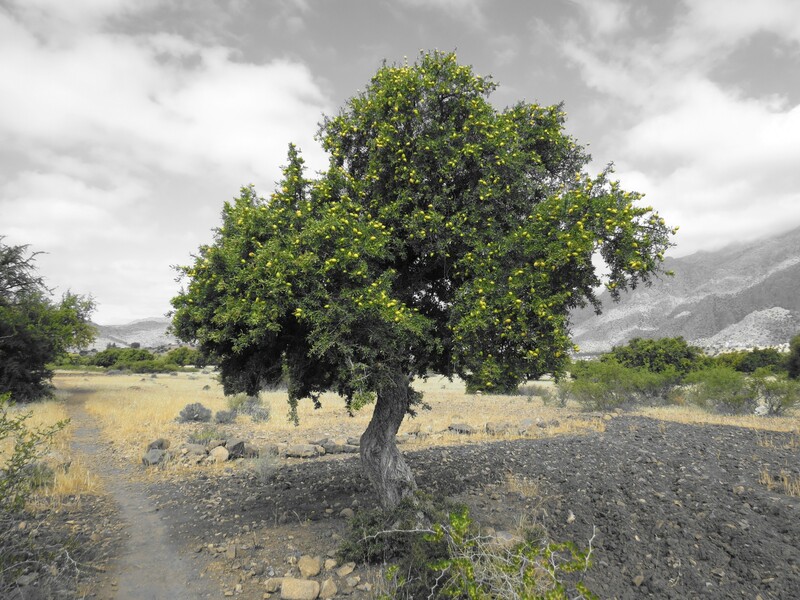 Standing in the middle of an orchard in the Ameln Valley, sweat trickling down between my shoulder blades (only partly due to the intense mid-day heat), visions of boar attacks, Lord of the Flies hunts and being gored by tusks simultaneously flew through my mind. There was only one thing for it. Feeling rather encumbered by all the cameras dangling around my neck, I stopped some time later and realised hubbie hadn’t followed me. Apparently he wasn’t going to be intimidated by a mere piggy and had proceeded, successfully, in out-staring the animal which eventually scuttled back into the dense thicket. Mopping my brow and trying to regain a shred of the dignity lost during my retreat, I returned to the battle scene amidst incredulous statements of “you could at least have taken a photo!” Damn it. I didn’t think of that in my panic. So here is a lovely photo of…not a wild boar in the Ameln Valley. Extracts from original blog post from The Conversant Traveller by Heather Cole Images courtesy of The Conversant Traveller – all rights reserved. 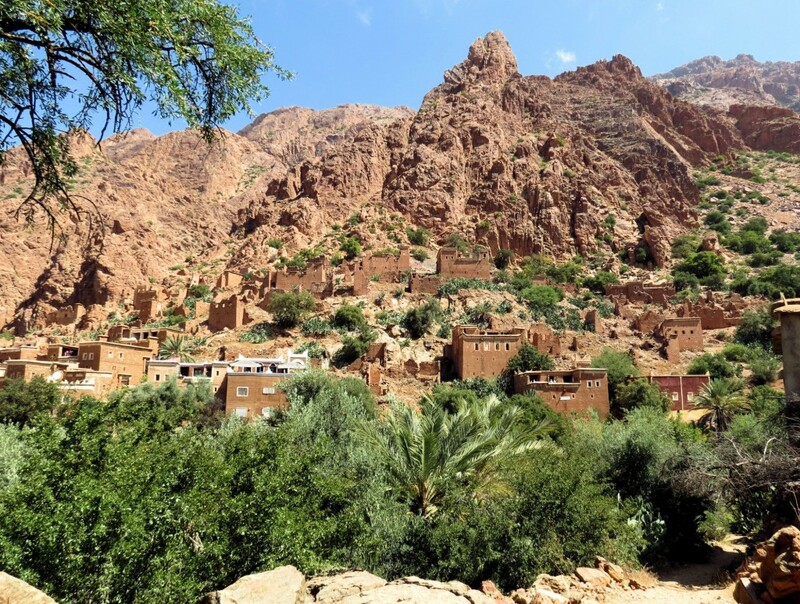 We were travelling though the Anti-Atlas Mountains with Wild Morocco, and decided to stop for a couple of days in the Ameln Valley to do some hiking. 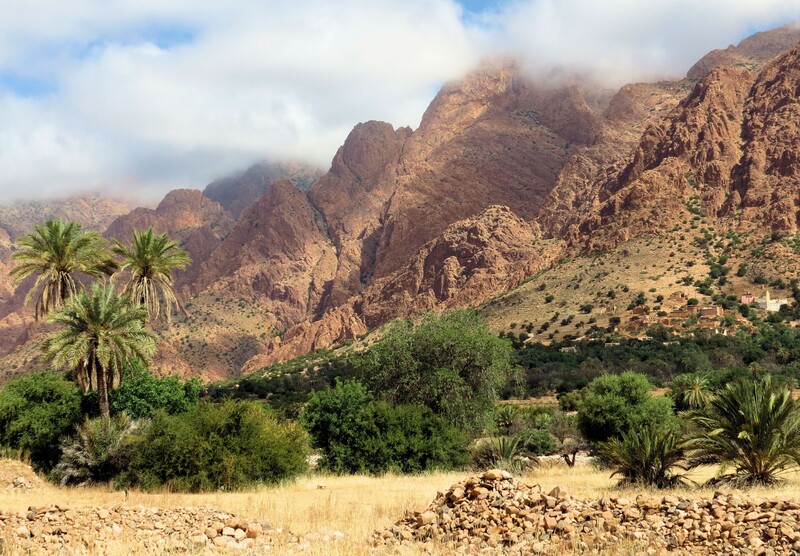 As with anywhere in Morocco, hiking is never just ‘hiking’! It involved wild animal encounters, lashings of sun-cream, getting lost and the inevitable invitation to tea. 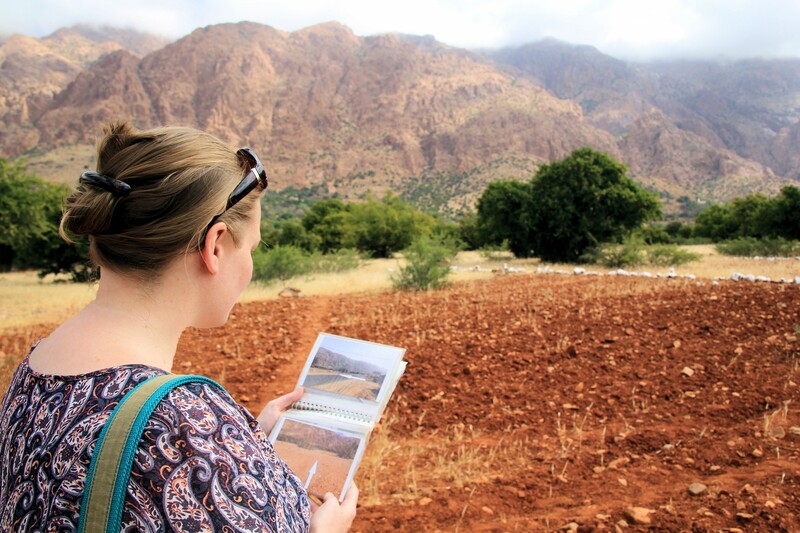 Armed with an inspired yet simple photo map from our guest house, Chez Amaliya, we set off along the valley, traversing argan and almond orchards, wheat fields and dry river beds to explore. And to find a lion! 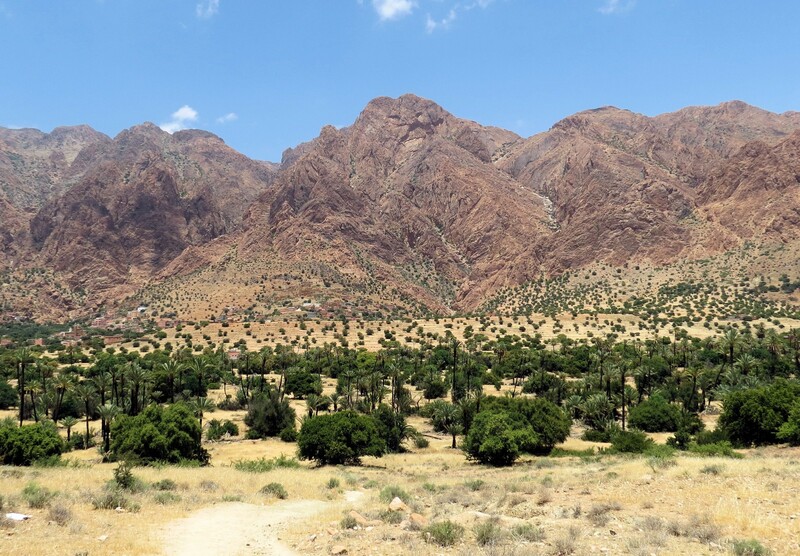 The first part of the trail was relatively easy to follow, and hubbie, in charge of navigation, did a grand job of matching up lumps of rock, barren trees and cacti with the map images. Further on though we dabbled a little in one of our favourite past-times. The trouble was, after the devastating floods of 2014 the landscape no longer mirrored our map photos, resulting in several scenic detours. And one wild boar encounter. The few locals we met along the way clearly weren’t used to foreigners ambling by every day. The women would hurriedly cover their faces with their headscarves when they saw hubbie, and small groups of men tinkering with tractors would cease conversing and watch me as I shuffled by, looking ridiculous with a white pashmina wrapped around my head against the sun. 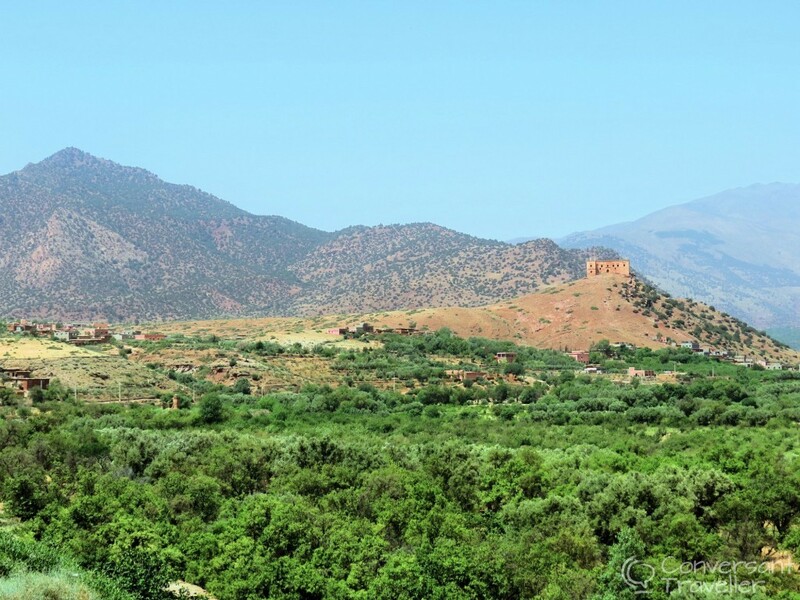 Some avoided eye contact, whilst others, often in the seclusion of the orchards, would offer a shy smile and appeared delighted when we attempted a little of the Berber we’ve picked up over the years. 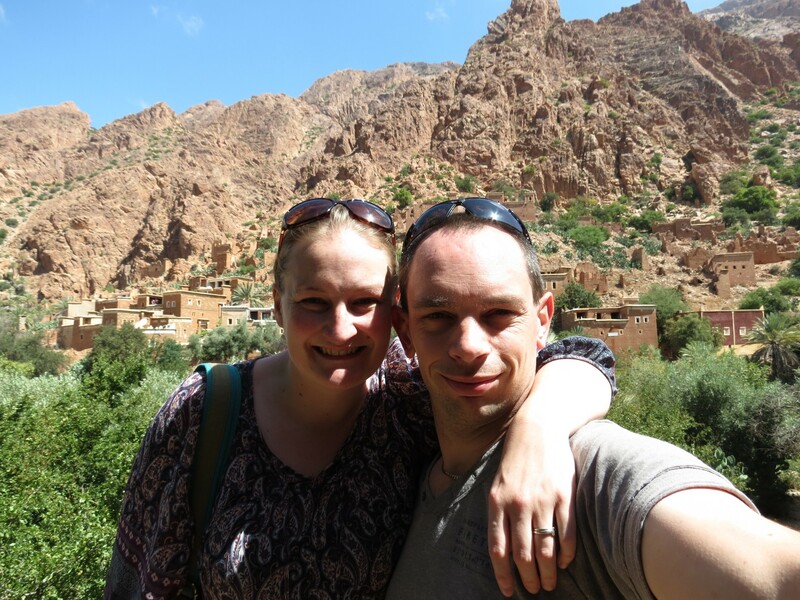 We didn’t see another tourist all day, and it felt like we’d discovered the ‘real’ Morocco. It was in Oumesnat that we were invited for tea. 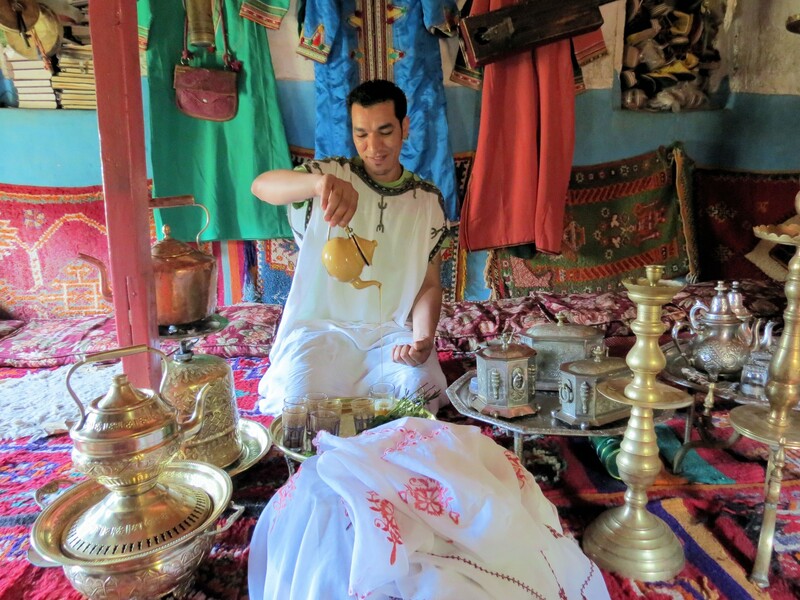 We came cross the amiable Mustafa who offered to show us inside his family’s 400 year old traditional Berber house. 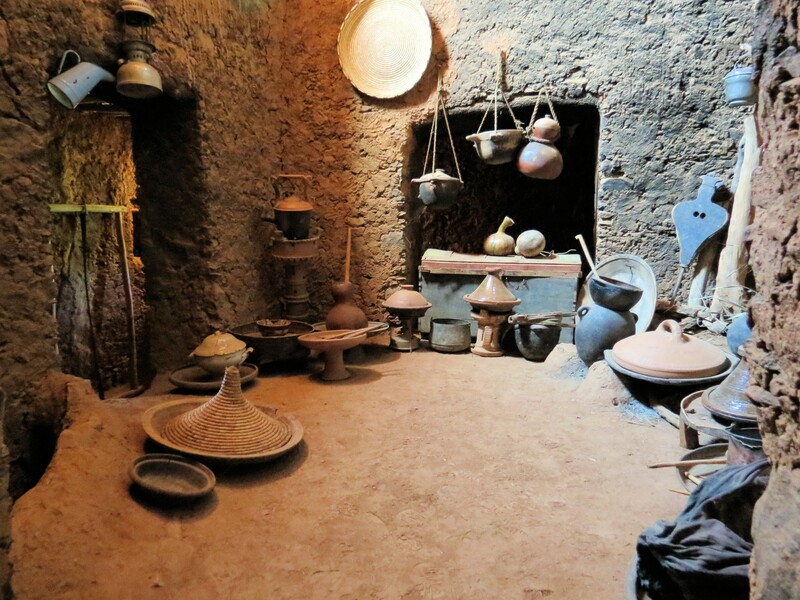 Today it is treated like a little museum and is an enchanting insight into how life used to be. Little has changed except a few hidden light bulbs here and there. Upstairs in the colourfully adorned guest quarters we met Mustafa’s father, who had in fact been born in that very room some years before. Sitting chatting over our mint tea, we learned about the significance of different women’s shoes, and were introduced to the family’s prized teapot collection. Clearly a symbol of wealth and status. Oddly enough, the jewel in the crown was in fact a teapot all the way from Manchester, a city just an hour from where we live in the UK! 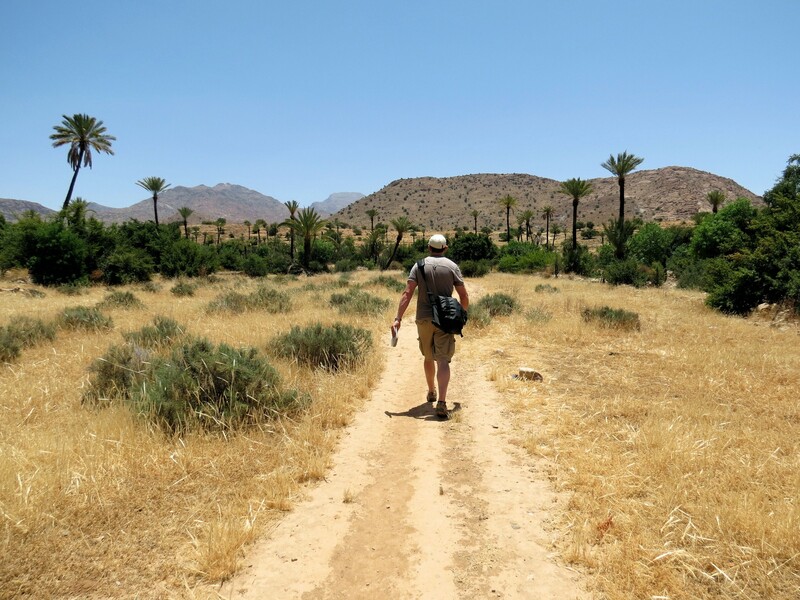 Some while later we bid farewell to Mustafa, his dad gently snoring with the radio on in the background, and continued along the trail to search for a lion. It took some time, a bit of squinting and the trialling of different angles, but finally we spotted it. The famous Lion’s Face Rock protruding proudly high above the village of Asgaour, keeping a watchful eye on the sleepy villages below. Can you spot the Lion’s Face Rock? By this time the heat was getting intense. The sun-burned rock of the towering mountains glowed a fiery orange, and even the locals had retreated inside to the relative cool. So it was time to find our way back to the guest house, which of course was easier said than done. Our map said turn left at the lone palm tree. “Turn left by the palm tree”…erm which one exactly?